Infusing green building knowledge into our lives starts with a yearning to create a positive, lasting change in the way we interact with the planet. That inspiration can lead us to seek out information and guidance from others to join a movement to a more sustainable lifestyle. We know that, although we may not be able to build or renovate a home or business so that it’s 100% sustainable, we can approach green building spaces with a goal to accomplish as much progress as we can. We can be open to new mindsets, materials, and approaches to sustainable living as a starting point to gaining green building knowledge. Building and renovating spaces to make them more sustainable creates living and working areas that are cheaper to operate, better for the environment, more comfortable, and healthier for the individuals within them. 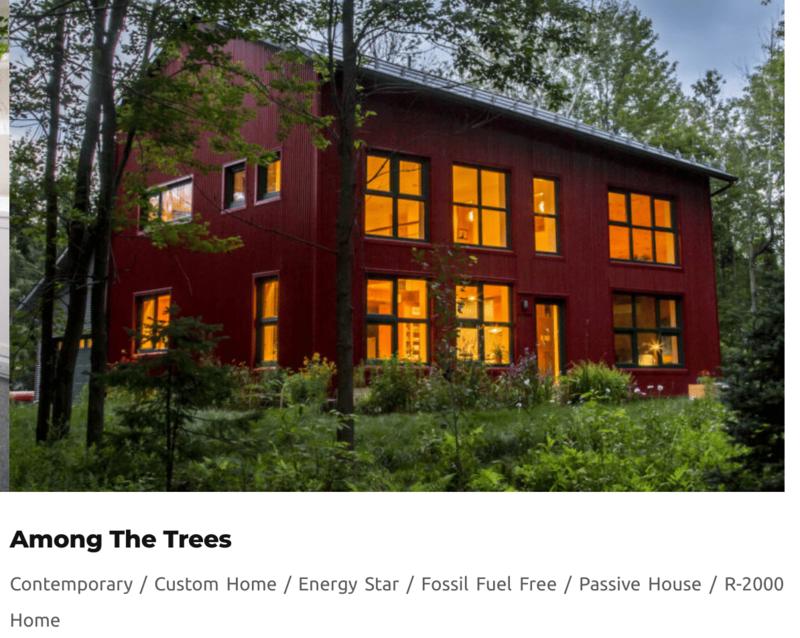 To get started, you might look to the example set by Ontario’s Casey Grey, whose company, the Conscious Builder, helps people to move toward “conscious” construction decisions to create a positive, lasting change, such as the home featured above. The company’s mantra is to be aware of how each decision we make and every action we take will have an impact on something and someone, somewhere. Making the move toward creating sustainable living and working spaces does take a new body of green building knowledge. Often, that starts with understandng an integrated design process (IDP) — a holistic approach to high-performance building design and construction. That means every member of your green building project should share a vision of sustainability and should agree to work collaboratively to implement sustainability goals. When an IDP is successful. your green building project will optimize systems, reduce operating and maintenance costs, and minimize the need for incremental capital. But where do you start? Learning about sustainable building is a process, so give yourself the freedom to absorb a variety of sources, principles, and ideas. manages solar gain to exploit the sun’s energy for heating purposes in the heating season and to minimize overheating during the cooling season. LEED-certified buildings typically use fewer resources and consume less energy and water than conventional buildings. LEED rewards buildings that take important strides to reduce impacts across multiple areas, including building site management, materials used, water and energy consumption, transportation options, occupant health and comfort, and more. 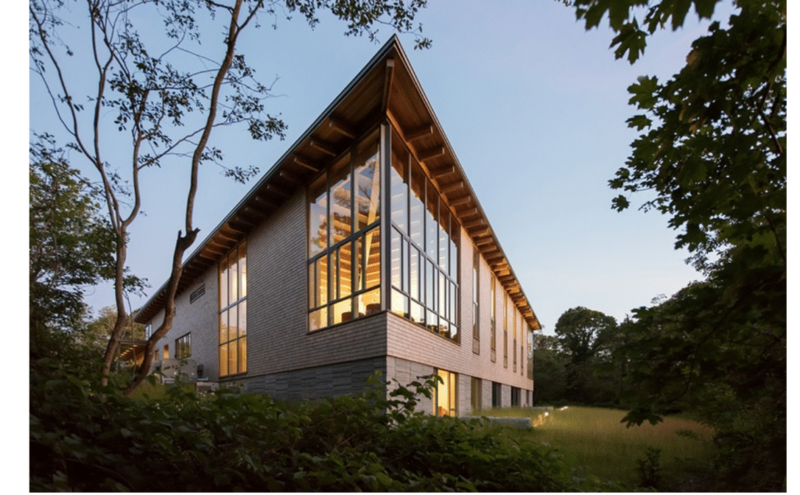 A new Cape Cod library has achieved LEED recognition while also preserving and enhancing an original one-room library building dating to 1898. Listed on the National Register of Historic Places, the Eastham Public Library is situated on a hillside site overlooking one of the town’s many ponds. The original small historic structure, which no longer met the demands of a growing community, serves as a headpiece to the new library building. The new structure was sensitively placed to the rear of the site and scaled to minimize its impact on the historic structure. THe LEED Gold certified building blurs the line between indoors and outdoors. Overall, the building takes full advantage of the library’s freshwater setting while minimizing the visual impact on the small structure from the road. A palette of naturally weathering materials—cedar shingles and siding as well as bluestone flooring—relates the contemporary structure to its seaside location and vernacular of the historic building. Commercial building owners and vendors convened at the Montgomery County Energy Summit in Silver Spring, Maryland on April 4, 2018 to learn and share ideas about how lower building emissions and sustainability can be good for business. The event was co-hosted by the county’s Department of Environmental Protection and the US Green Building Council. If you wish you had been able to join in the folks at the Montgomery County Energy Summit, maybe you’d like to check out some of the opportunities in the next section to learn more about sustainable building. Organic buildings are increasingly necessary as we recognize that the earth’s climate and our human-made environment is at a tipping point. Designers and builders everywhere are starting to embrace a more urgent and far reaching purpose and responsibility to the planet. Oesch Environmental Design, recipient of the Virginia Sustainable Building Network Green Innovation Award for Best Green Designer, will offer a presentation on April 10, 2018 that describes state-of-the-art practices and conceptual future systems and methods. These are needed to create organic buildings that embrace accountability with respect to climate change and quality of life. Inspiring current opportunities and evolving case studies will be explored. Indoor air quality has become an important topic within the green and sustainable building industries. The air that people breathe indoors impacts everything from functionality to cognitive ability. So designers, builders, and facility managers continually seek to ensure that indoor air is contaminant-free. Southface Energy Institute is offering a webinar on Wednesday, April 18, 2018 to explore indoor air quality trends and how participants can gain better air circulating through their facilities. Sessions will include an introduction, the importance of monitoring, challenges in monitoring, understanding data, and applications of indoor air quality. Green building sector usable ideas and processes will be the focus of the 17th annual Municipal Green Building Conference and Expo on April 19 at the SoCalGas Energy Resource Center in Downey, California. “This year’s theme is ‘Innovative Cities Leading the Way to a Sustainable Future.’ But innovation can only take place when fresh ideas and practices can be discussed with those who will be implementing them in their cities,” Dominique Hargreaves, U.S. Green Building Council-LA executive director, says. “This year’s panels do just that, through some of today’s touchpoints as ZNE [zero net energy], distributed energy, waste, transportation and health and wellness. We also address developing the vital next generation of thought leaders.” The event will introduce a new Sustainable Cities Tech Challenge for startup companies to present future usable products or ideas for municipalities. Making green schools a reality is the focus of the Green Schools Conference & Expo, which will take place on May 3 & 4 in Denver, Colorado. This is the only national event to bring together all the players involved who lead, operate, build, and teach in US schools. This year, GSCE will be hosted in partnership with Rocky Mountain Green, a regional sustainability conference. USGBC’s mission is to transform the way buildings and communities are designed, built, and operated, enabling an environmentally and socially responsible, healthy, and prosperous environment that improves the quality of life. Gaining a background in green building knowledge takes time and conscious decisions. But the return on our efforts can be substantial. Energy efficient, green-designed systems improve air quality by eliminating initial pollutants in building materials, ventilating current airflow effectively, and filtering out new pollutants. Green-built buildings mandate vital features that save water, lower water bills, and provide an overall more efficient system. For example, rigorous National Green Building Standards (NGBS) offer tangible benefits to homeowners who can take pride in their energy efficient homes and their participation in a sustainably built community. A North Carolinian home built according to the NGBS regs is approximately 24% more efficient than other homes there. Owners there who opt up can increase their home’s energy efficiency up to 80%. Perhaps the take-away is to start small by choosing a sustainable building design project that is manageable within a short period of time. A pellet stove in cold climates is climate neutral, for instance, fairly affordable, and alleviates your need to rely exclusively on fossil fuels for heat. What’s most important is that we accept the challenge to make our living and working building spaces as sustainable as possible, as they’re an essential element in the fight to mitigate climate change.